Product #1276 | SKU EF1740USML | 0.0 (no ratings yet) Thanks for your rating! 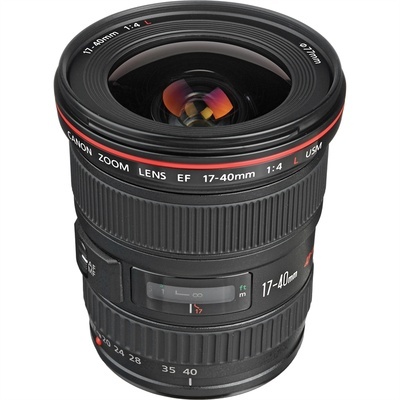 Spanning a versatile wide-angle range, the EF 17-40mm f/4L USM Lens is a Canon L-series zoom featuring a constant f/4 maximum aperture along with a sophisticated optical design and durable construction. One Super UD element is featured, along with three aspherical elements, which help to reduce both chromatic and spherical aberrations in order to realise high sharpness, clarity, and colour accuracy. A Super Spectra coating has also been applied to suppress flare and ghosting for improved contrast in difficult lighting conditions. Complementing the imaging capabilities, this wide-angle zoom also features a ring-type USM and internal focusing mechanism to afford quick, quiet, and accurate autofocus performance, as well as full-time manual focus override. Additionally, this lens is weather-sealed for use in trying environmental conditions. Wide-angle zoom is designed for full-frame Canon EF-mount DSLRs, however can also be used with APS-C models where it provides a 27.2-64mm equivalent focal length range. One Super Ultra-Low Dispersion glass element noticeably reduces colour fringing and chromatic aberrations for high clarity and colour fidelity. Three aspherical elements minimise spherical aberrations and distortions for improved sharpness and accurate rendering. Super Spectra coating has been applied to individual elements to minimise ghosting and flare for greater contrast and colour neutrality when working in strong lighting conditions. In addition to the front 77 mm filter ring, this lens also has a rear filter holder for up to three cut gel filters.